Recent figures from the property register confirm the Spanish housing market expanded last year for the first time in 4 years. It’s the first bit of good news from the Spanish property market for several years, with 445,885 house sales last year, an increase of 5.38pc on 2009, according to the latest figures from Spain’s property register. Discount to asking price accepted by vendors: 30% of vendors accepted up to 10% lower, 43% accepted between 10 and 20% lower, 19% between 20 and 30% less, and 7% more than 30% less. Change in stock of properties for sale since the end of 2010: 58% of agents reported an increase. Vendor openness to offers: 88% more open than a year ago. Main reasons why sales fall through: Vendors asking too much in 26% of cases, buyers offering too little in 40% of cases (remember, this is all in the opinion of estate agents), and banks not giving finance in 34% of cases. Enquiries so far this year: Falls up to 20% or more say 51%, whilst 24% say an increase of up to 10%. Sales so far this year: Falls of up to 20% or more say 71%, whilst 19% say an increase of up to 10%. Expectations for the first quarter of the year (compared to same period last year): 47% say worse, 27% say the same, 26% say better. Expectations for this year: 33% say worse, 28% say the same, and 38% say better. However you wish to digest facts, figures and statistics, the bottom line is that it’s still a buyers market in Spain and a great time to buy a property for anyone with a long term vision or for their own use. As always the key when buying is location and with an abundance of quality property for sale in Spain, this could make now the perfect time to invest. The Costa del Sol is looking forward to the 2011 holiday season with optimism and plans to extend and improve leisure facilities on the beaches. The optimism is based on figures for 2010 showing a 1.1% increase in visitor numbers compared with the previous year and other positive indicators, while promoters of such amenities as spas, creches, yoga and pilates sessions are just awaiting the green light which will come in April when competence over the beaches is transferred from the Costas authority to the Junta de Andalucia. To be precise the increase in passengers using Malaga Airport in January was 8.1 per cent, two percentage points higher than the average for Spanish airports. This was the second greatest increase out of all of Spain’s large airports, behind Barcelona which started 2011 with an increase of 20 per cent. According to figures for last month released by the airports authority Aena, in January 589,994 passengers used the terminal on 6,329 flights. 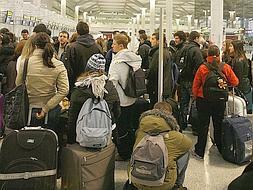 The figures are a vast improvement on 2010 when passenger figures fell in January. Also last month the number of passengers on international flights landing at or taking off from Malaga Airport increased by 6.8 per cent. The majority came from or travelled to the UK, 187,322 passengers, while 46,257 travelled between Malaga and Germany, and 26,070 between Malaga and France. The Spanish government has promised new planning laws and an end to the confusion surrounding “illegal” homes in a bid to woo back the British property buyer. There are 800,000 unsold homes in Spain – half of them near the coast. Most are now at heavily discounted prices which should make them attractive to bargain hunters. Housing Secretary Beatriz Corredor has revealed in an interview that the Spanish government is to steer a package of legal reforms through Parliament this month, and in coming weeks the government will also launch a series of road shows around Britain and other northern European countries to promote Spain's property market. She said the new laws would eliminate the confusion that has led in some cases to British home owners being told to knock down their properties because they were illegally built. She asked prospective buyers to “trust in the system that we have and the transparency we provide”, tempting them with prices significantly lower than two years ago – housing prices in Malaga have fallen on average by 24 per cent. Overall, since the country’s economic crisis began, prices have plummeted by up to 40 per cent and banks and construction firms are desperate to recoup their investment. In recent years, one third of all Spanish properties sold to foreigners have been bought by Britons, but many are now being put off by horror stories of planning permission being retrospectively revoked and other complications, so numbers have slumped. But the government is now trying to right all the wrongs committed in the past by local councils, builders, real estate agents and lawyers, who all reassured foreign buyers that any issuing bits of papers could be obtained “later” without any trouble. To correct this, a key element in the package of legal reforms is that for any property being sold the local council will be obliged to provide a document stating clearly its boundaries, the category of land on which it stands, its access to services including water and electricity, and details of its planning approval. The Minister of Development for Spain, Jose Blanco, has announced a set of new measures he hopes will give his country's property market a much needed shot in the arm, reports Spanish Property Insight. Like the rest of the Spanish economy, the nation's housing sector is in a state of freefall, something that's been compounded by the country's fuzzy property laws. In an effort to boost the market Blanco wants to change Spain's attitude towards property rights, especially those of money-rich foreign investors. Speaking before the Parliamentary Housing Commission he made it clear he wants to make Spain more attractive to overseas buyers than it currently is. The plans he outlined include reinforcing legal protection for those who buy homes and holiday rentals in good faith, and holding international press conferences to win the confidence of investors. He also promised to build the sort of homes foreign investors require and wants to reduce a market-stifling glut of new builds. Blanco said price reductions will be needed in areas suffering from an oversupply of new homes and new jobs are still required to stimulate the market. But already his plans represent a major sea-change in the way Spain deals with foreign investors.